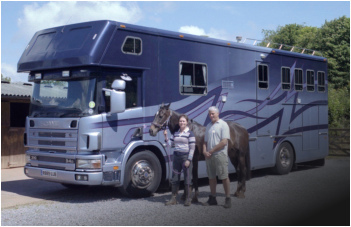 It is the responsibility of all road users, including users of horseboxes and horse trailers, to ensure that their vehicles are in a fit and roadworthy condition. The DVSA has the power to stop any large vehicle or trailer in order to inspect the driver’s documents as well as the vehicle itself. If any problems are identified, the DVSA has the power to fine the driver, fine the owner and even impound the vehicle. an analogue or digital tachograph. an upgraded driving licence entitlement. a Driver Certificate of Professional Competence (Driver CPC). a Certificate of Professional Competence for Transport Managers (Operator CPC). construction and use of vehicles.